When shooting movies with your Flip Video camera and editing them with FlipShare, you might need to cut a few frames from a clip. Sometimes a video clip contains a little too much extra footage that you need to trim. Fortunately, you can use FlipShare’s Trim Tool window to remove unwanted sections of footage from the beginning, end, or both the beginning and end of a selected video clip. 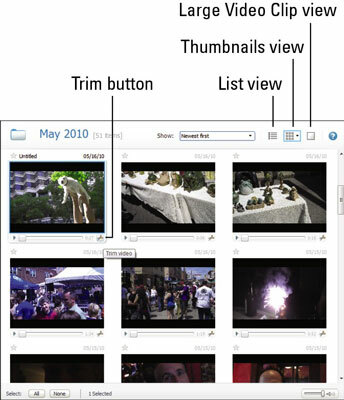 Click the Trim button (the scissors icon; see below) in the lower-right corner of a video clip thumbnail in the Workspace when viewing your clips in either Thumbnails view or Large Video Clip view. Don’t worry that trimming a clip means the parts you clip are gone forever. Even though trimming makes it appear as if the sections of snipped footage are gone for good, those trimmed parts still exist. FlipShare simply hides and ignores the sections as if they’re gone based on your trim choices. As with all things that seem to vanish when you’re working on a movie project file, the original files you imported into FlipShare (stored in the folders under the Computer section of the Navigation pane) remain intact regardless of how you slice, dice, or otherwise transform the video clips you play with in the Workspace pane. Click a clip in the Workspace that you want to trim to select that clip, and then choose Edit, Trim to open the Trim Tool window. The Seek slider bar beneath the video preview window changes to the Trim Tool slider bar, which has start and end point sliders at either end. The scroll bar button appears to the right of the left-side start point slider. 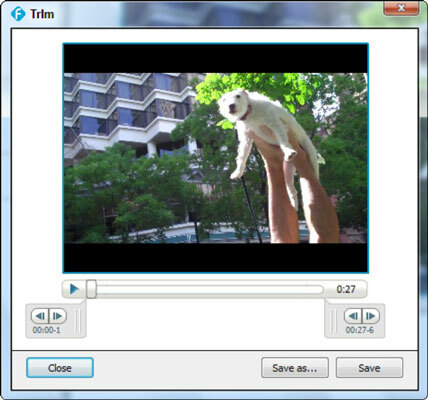 Click and drag the Trim Tool slider and the start and end point slider buttons to frame the section of your video clip that you want to keep. Note: You can drag slider that’s between either of the Trim Tool sliders to quickly move around in your video to find the section you’re looking for. The parts between the left and right sliders are what stays, and the parts on either side of the sliders are removed. That is, the section of footage between the start and end point sliders is the footage you want to keep. Click Save As. The “Save Trimmed Video” dialog box appears, where you can enter a name (in the Video Name text box) and then choose a new location if you want to save your trimmed clip in a different folder than what’s selected. Click Save when you’re done to save your trimmed clip and return to the Trim Tool window. Note: Back in the Trim Tool window, click the Close button to close your video clip without saving your original video clip. You already saved a copy of the trimmed clip using the Save As button. The Trim Tool window closes, and your trimmed clip appears in the Workspace. 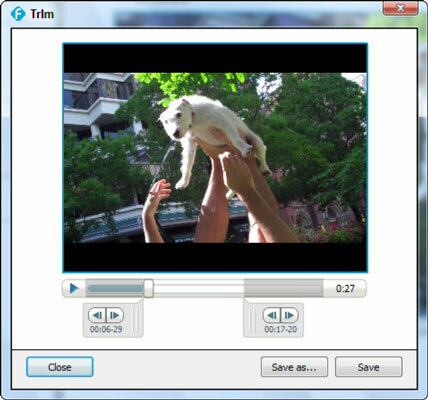 Select your trimmed video clip, and then choose Edit, Trim to display the Trim Tool window. Drag the start point trim slider all the way to the left and the end point trim slider all the way to the right; then click Save. The Trim Tool window closes, and your restored clip appears in the Workspace.